Kit designed for taking air samples and determining air quality. Measures six key air pollutants, including Ammonia, Carbon Monoxide, Chlorine, Hydrogen Sulfide, Nitrogen Dioxide and Sulfur Dioxide. 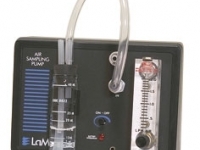 Durable, easy-to-use pump for taking air samples.